Transition Town Bandon and Bandon Tidy Towns planted over 100 trees on the Bandon By-Pass on Friday, 12th March, 2010. A big thank you to the students of St Brogans School and Colaiste na Toibhairte as well as to Cope and the Rosminians for assisting us with the planting. We have donated apple trees to the Gael Scoil, Laragh National School, Bandon Grammar School and St Brogans so that they will be planted on the school premises. 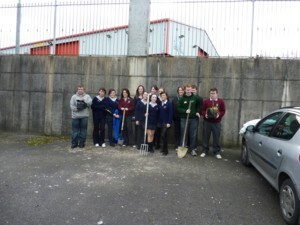 We welcome other schools in Bandon to participate in this project. We have 200 trees still to plant so the project will continue next Friday, 19th March, 2010. You are currently browsing the archives for the national tree week category.